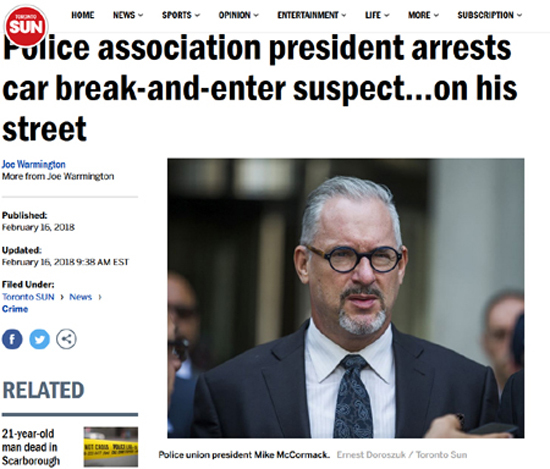 A suspect stealing things from parked cars at six in the morning, was probably shocked when he was apprehended in the act by Mike McCormack, the president of the Toronto Police Association, despite the fact that Mike had not strapped on his gun and badge for ten years. According to a report in the Toronto Sun by reporter Joe Warmington, it all started when McCormack went to his car in his driveway heading to a number of media interviews about the association’s upcoming non confidence vote on the Toronto chief. Warmington writes: Mike figured his fully loaded Tim Horton’s card must have fallen down under the seat at the same time. About three doors down, though, was a man looking in cars. Suddenly, the 30-year cop — who has spent the last decade in civilian clothes fighting for the men and women who do the job — was thrust back into front-line duty. “I spun around the block and came back and he was still there,” said McCormack. McCormack got out of his car and had a word with him. “John Mellencamp,” was his answer. Instead, he started singing a different tune. “I was teasing McCormack was never quite the famous detective his legendary dad, Chief Bill McCormack was, but he did put two and two together,” the reporter wrote. Back at the station, the cops were teasing McCormack that you can take the cop out of the uniform but not the “cop” out of the cop.